A freshman student at California High School in San Ramon was arrested last month for allegedly plotting a shooting at the school. Melissa Colorado reports. A freshman student at California High School in San Ramon was arrested last month for allegedly plotting a shooting at the school. With his arrest, San Ramon police say a potential tragedy was averted. "It's very scary I was glad that the administration and the school acted very fast to this," said parent and San Ramon resident who chose to remain anonymous because her son attends California High and knows the 14-year-old who was arrested. In a letter to parents, the principal said the student was scheming to attack students three years from now, during the student's senior year. A friend of the student who was aware of the alleged plan came forward and shared the information with a school staffer. "I'm grateful that he did for the safety of all the students at the school," said the parent. "So I think the school has really set forth the message – 'see something say something.'" According to the student who alerted staff, the suspect had a hit list with the names of six students. "Typically there are people that students are upset with," said Becky Chestnut from the San Ramon Police Department. "That’s very common these threats, unfortunately, more normal now that they’ve ever been in the past." 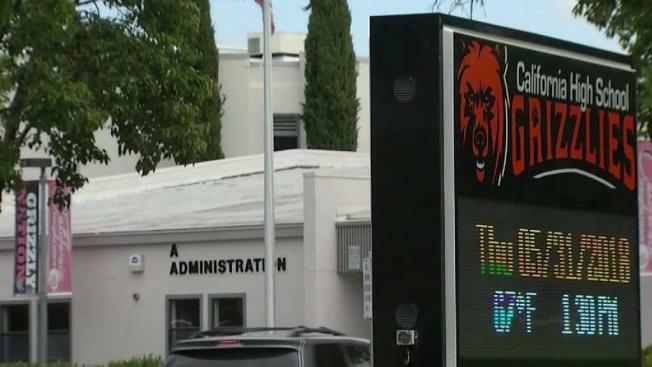 California High Principal Sarah Crawford wrote to parents, "The District considers this offense to be extremely serious and will take appropriate disciplinary consequences as per California Education Code. I want to commend our student for doing the right thing and reporting the information to an adult." "It’s very scary," the parent said. "It's a small school and the kids do know each other, it's a small community." It is still unknown if the district will expel the student, but San Ramon police say the 14-year-old is no longer in custody after being arrested on conspiracy-related charges. Contra Costa D.A.’s office reviewed the evidence and decided not to press charges.